We consider a bird-feeding station a "must-have" for every homestead. It is simply backyard entertainment at its finest. At our location here in North Florida, we enjoy a colorful and fascinating bird show year-round. Although you can hang your bird feeders from a tree limb, this makes birds more vulnerable to sneak attacks by predators; house cats can catch them and snakes feed on bird eggs. 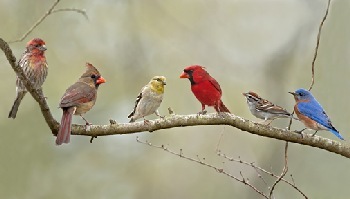 Read on for our recommendations for the best bird feeders on the market. Why not get creative and build a free-standing bird-feeding station like we did? We took a pressure-treated 4X4, predrilled 2 holes in the top of the post and sunk it 3 feet into the ground. We then pushed two aluminum pipes (like shower curtain rods) into the holes, to suspend the feeders from... and voila! We live in a heavily wooded forest and are plagued with common tree squirrels. And boy, do they love to snack on wild bird seed! We tried three other bird feeders, which our clever squirrels successfully raided at will. We almost gave up on the project until we came across the Brome Squirrel Buster Plus Wild Bird Feeder. Suddenly, our problem was solved. These really are squirrel proof, the manufacturer actually guarantees it. 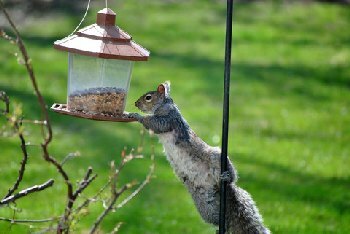 We have personally seen many squirrels foiled in their attempts to raid these feeders. That was quite a show all by itself! The six feeder ports around the bottom of the device stand open so the wild birds can land on the perch ring and feed freely. However, when a heavier critter, such as a squirrel, rat or large nuisance bird like a crow lands on the perch ring, the added weight drops a shroud down, closing all six ports. The unwanted visitors are denied feed; but they are not harmed in any way. 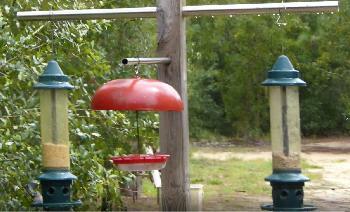 You can see our own Brome bird feeders in action in the video at the bottom of this page. As much as we enjoy the wild bird show at our station, we treasure even more watching the tiny, enchanting hummingbirds which often visit. The "upside-down bottle" style tends to leak and attract ants, bees and wasps. Feeders without a dome cover are exposed to heavy rains, which dilute the nectar/food. Most Hummingbird feeders do not have a perching ring, so the hummers are always in motion (flying). We have and recommend a feeder with a perch for this reason. 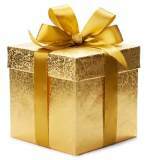 The tiny birds have a chance to stop flapping their wings and rest (while conserving vital energy) as they feed. This encourages a longer stay and gives you a clearer view of these beautiful creatures. We spray painted the outside of the dome with cheap flat red spray paint, also to help attract hummingbirds. 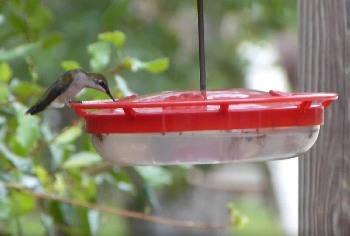 See our Hummingbird feeder combo in action, with a cool green visitor, in the video below. Dissolve the sugar in the boiling water by stirring constantly. Let mixture cool. This makes the perfect amount for the Hummingbird feeder we use. You should try to change to fresh nectar every 3-4 days. Did you know that those sweet-looking hummingbirds are actually mean little buggers? We have never seen two or more hummers sharing, feeding at the same time. One bird sometimes "dive-bombs" another while fighting over the feeder. You can actually hear tiny little screams from them as they scold each other! Hummingbirds put on an interesting Backyard Homestead show. Don't miss it!